He is collecting her, scooping up the crumbs that fall from her mouth, clutching at them, cradling them. 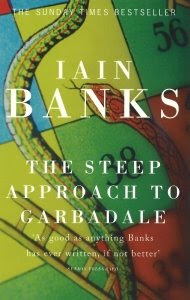 One of Iain Bank’s main strengths comes from writing scenes that he is able to imprint on your mind with such force that they stay there like a branding. If you were to flip anyone’s head open that has ever read one of Iain’s books, I’m sure you would see some of his paragraphs stamped there, smouldering slightly. Her auburn hair sucked down at last like fine tendrils of seaweed. The story revolves around Alban Wopuld who, after years of exile, is pulled back to his family’s highland estate, Garbadale. The family has amassed a fortune around their board game, Empire! and has to decide if they are going to sell out to the Americans who want to buy them out. Which is okay – it’s not something that grabs you on the dust jacket, but beneath that is a tale of Alban finding, loosing and becoming obsessed by his first love Sophie who just happens, unfortunately for him, to be his cousin. There is the need to be accepted, somehow, some time, by his girl in the garden, by his lost love, by Sophie. He’s getting another roaring in his head, and tunnel vision. Last time this happened he’d been smacked full in the face by a football. He just pictured her as the same girl she had always been, but stopped, frozen, paused, something caught in amber. What do I really want? He thinks. This is, of course, an extremely good question. It was just such a pity that, life as it tended to be, it so rarely came as part of a matched pair, with an extremely good answer. The whole thing hooks you in; you care about Alban and what lies before him as he scree runs down the steep approach to Garbadale to discover his fate. Coming soon The View From Here Interview with Iain.